Our store is The Country Cupboard. The products offered are produced on the farm or baked in our kitchen. We make cheese from the milk from our cows! The beef, pork and eggs are raised and produced on our farm. Our meat is processed in a state inspected processor so that you are assured of a high quality product. Try our Cinnamon Ridge bacon. We offer it in Hickory Smoked, thin and thick cut, and peppercorn flavored. From our kitchen we offer fresh baked bread and our famous Cinnamon Ridge cinnamon rolls. For those with a sweet tooth, there is a selection of bars and cookies. We also offer soap made from milk and and wood working items. Check out our Facebook page for our weekly offering. No need to travel to Wisconsin to get your fresh cheese curds. 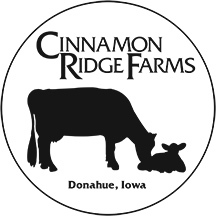 Cinnamon Ridge makes cheese right here on our farm! Our cheese can be purchased in our store. Local chefs buy our cheese and serve it in their restaurants. Our beef is naturally fed a forage and grain diet. Click here for more information.